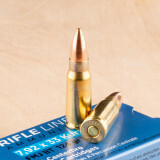 One of the first widely used intermediate cartridges in history, 7.92x33mm Kurz ammunition is closely associated with the StG44, the first modern assault rifle fielded by Germany during World War II. It was designed to bridge the gap between the hard-kicking, long-range 7.92x57mm and the short-range 9mm Luger. 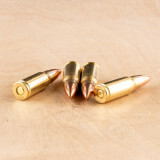 This caliber fires a 125 grain full metal jacket bullet at a muzzle velocity of 2,250 feet per second, delivering good medium-range performance. It is no coincidence that these specifications closely resemble those of the later 7.62x39mm used by the Soviets. Only Prvi Partizan is still producing factory ammo for the 7.92 Kurz. Fortunately, their ammunition is good quality, brass-cased, non-corrosive, and reloadable - you'll often find it in-stock and for sale here at Widener's. 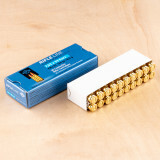 You can get the 7.92x33 Kurz ammo you need for target shooting and training by ordering this 20-round box of top-quality ammunition from Prvi Partizan. 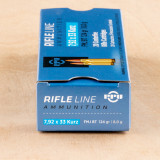 This box is loaded with full metal jacket boat tail ammunition, which makes it effective for accurate shooting in autoloading rifles. Thanks to quality materials and an excellent design, these bullets will cycle smoothly through the chamber and deliver consistent firing. The 124-grain bullet comes out of the barrel with an initial velocity over 2,200 feet per second and an energy well above 1,000 foot pounds. This ensures excellent trajectories and fabulous performance at the target. Prvi Partizan is one of the leading names in global ammunition. This Serbian manufacturer has over 400 different ammo products, including cartridges for many different rifles and handguns. Since 1928, Prvi Partizan has been setting a high standard for consistency and precision, and you can turn to this brand for all of your hunting, target-shooting, and self-defense needs.